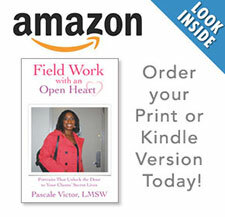 After reading this book you may want to consider whether or not this profession is right for you. You may second-guess yourself and wonder if you have what it takes to handle the endless challenges that are part of this career path. I want to emphasize that while there are hurdles, the ultimate satisfaction you will have in knowing that you can help others who are less fortunate than you is unmatched. I guarantee this profession will give you a new and profound perspective on life. I would like to offer some insights and examples about the emotional aspects of this career so you can be better prepared about what lies ahead of you. It has taken some time, but I have finally developed a thicker skin. I can still remember the times when I broke down and cried after dealing with a difficult case. At first, I dealt with some clients whose lives were very sad. After spending time with them I went home and cried so much that I actually felt like I had no more tears. One of these situations involved a client who needed to be hospitalized against her will because of medical problems. I felt guilty and obligated but I knew I had to support the wishes of her family and get her the help she needed. After an entire summer of dealing with one such heartbreaking emergency after another, I was emotionally depleted. Then I received a phone call that my mother had fallen. I had to meet her at the hospital. Thankfully, she had only broken her foot, but I completely broke down and could not stop crying. It was only much later that I realized the stress of the job and the emotionally draining summer had built up to such a point that it had to come out sometime. Another crying episode occurred when I worked with a family that was dealing with the death of their mother and disabled daughter after a fire. I returned home on a Friday night and spent the entire weekend sobbing. When I returned to work on Monday and shared my breakdown, a colleague reported having the same experience. On a more positive note, there are many different areas of specialty in the profession, should you decide that field work is not for you. The options are endless, such as becoming an advocate for children, the elderly, and the mentally or physically disabled; helping victims of domestic violence and other horrific crimes or involvement with policy-making. You may find work as a social worker in the school, court or hospital systems as well as other jobs where you remain in your office. Most importantly, this is a “helping” profession where you have the potential to effect change or another person’s life.